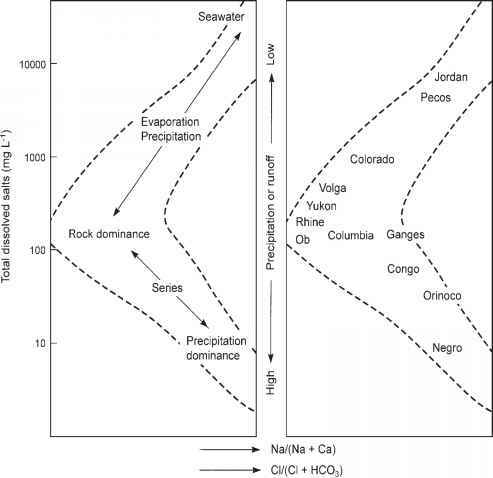 The relative proportions of CO2, HCOj , and CO2~ are pH-dependent (Figure 4.5). 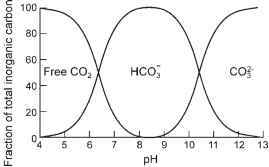 At a pH below 4.5 only CO2 and H2CO3 are present, and almost no bicarbonate or carbonate can be found. Indeed, bicarbonate concentration commonly is measured by titration with a strong acid until reaching a pH of about 4.3. At higher pH values dissociation of carbonic acid occurs, bicarbonate and carbonate are present, and CO2 and H2CO3 are no longer detectable. At intermediate pH values, HCOj predominates. These dissociation dynamics are influenced by both temperature and ionic concentrations, and the relationships shown in Figure 4.5 may not be valid for water of very high ionic concentration. The inorganic carbon (C) required for photosynthesis is most easily obtained from CO2, although many photosynthetic organisms can utilize bicarbonate. By influencing the forms of inorganic C available, shifts in pH can influence the efficiency of different primary producers in the ecosystem. the buffering capacity of water is critical to the maintenance of life. The pH of water is a measure of the concentration of hydrogen ions, hence the strength and amount of acid present. Because the scale is logarithmic to the base 10, a decline of one pH unit represents a tenfold increase in hydrogen ion concentration. In natural waters, pH is largely governed by H+ ions from the dissociation of H2CO3 and OH~ ions from the hydrolysis of bicarbonate. Rain normally is acid (typically near a pH of 5.7) because of its CO2 content and also due to naturally occurring sulfate. Normally, these acids are neutralized as rain water passes through the soil. However, in catchments of hard rocks, little buffering capacity, and high surface water (as opposed to groundwater) inputs, streamwater will be acid even if pollution is absent. Organic acids also contribute to low pH values. Where decaying plant matter is abundant, especially in swamps, bogs, and peaty areas, humic acids result in "brown" or "black" waters, and a pH in the range of 4-5. In addition, volcanic fumes and local seepage from sulfurous or soda springs can produce natural extremes of pH. Over the past several decades, industrial activity has contributed to acid precipitation in many areas. The strong inorganic acids H2SO4 and HNO3, formed in the atmosphere from oxides of sulfur and N released in the burning of fossil fuels, have seriously lowered surface water pH in large areas of Europe and North America, especially in granitic drainages with poor buffering capacity. These anthropogenic inputs initially produce only slow declines in pH, but as the bicarbonate buffering capacity becomes exhausted further acid inputs cause pH to decline rapidly. 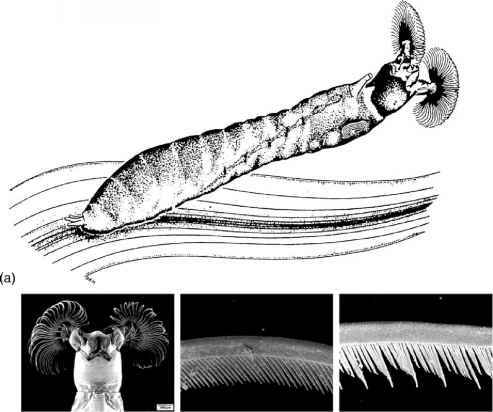 The biological consequences can be severe, and will be described later in this chapter. Alkalinity refers to the quantity and kinds of compounds that collectively shift the pH into the alkaline range. The bicarbonate buffering system is mainly responsible for alkalinity. It is a measure of the capacity of the solution to neutralize acid, and is determined by titration with a strong acid and expressed as milliequiva-lents per liter or milligrams per liter. Often alkalinity is measured as milligrams per liter of CaCO3, which measures the acid-neutralizing capacity due to carbonate and bicarbonate. Because alkalinity is determined from a filtered sample, it measures the capacity of solutes to neutralize acid. Acid neutralizing capacity (ANC) is similar but is determined for an unfil-tered sample, and thus measures the capacity of solutes plus particulates to neutralize acid. Hardness is another commonly used water quality term. It is determined by cations that form insoluble compounds with soap, and so primarily is a measure of the amount of calcium and magnesium salts. Ca and Mg occur mainly in combination with bicarbonate, sulfate, and chloride, and the common co-occurrence of calcium and bicarbonate has led some to equate hardness with alkalinity. However, it is possible to find very high alkalinity with very little calcium or magnesium, and so it can be incorrect to equate these terms.